In my first few minutes with the PS4 HD remaster of Final Fantasy XII I was awestruck by how fresh it looked. As a recent blog post by designer Robert Yang explains, however, the new game’s new coat of paint seems to have come at the expense of its soul. Remasters are getting more and more common every day. The category has grown so much over the last few years that it’s now necessary to break it down even further in order to distinguish complete remakes like Metroid: Samus Returns from games like that receive graphical overhauls but otherwise remain the same underneath like The Last of Us on PS4. The Zodiac Age falls into the second group. The gameplay remains untouched and it doesn’t include original assets. Instead things have been retouched using the computing resources of the PS4 to take the game beyond what it was graphically capable of on the PS2. And at first glance it looks absolutely great, closer to how you remember Final Fantasy XII looking then how it actually looked. But upon closer inspection, there’s something missing. Remixed to look more crisp and vibrant, the game lacks the same cohesion of the original’s blurry impressionism. In the above comparison, you can see what this means in practice. 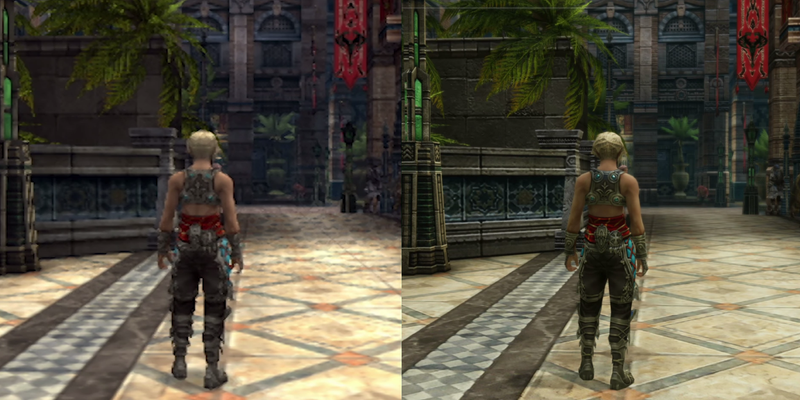 On the right, The Zodiac Age is more clearly defined with details that are easier to discern, while the left shot taken from the original game on its native 480p resolution running on the PS2 looks muddy. What it lacks in sharpness, however, it makes up for with depth. The carpets towards the back of the shop are dark and faded. Individual textures are weaved together by shared volumes—dark floors and wooden counters contrasting with the warm lights hanging from above. In the remaster, the contrasts have been ramped up so that every little object pops. You can see what he means with this scene that takes place early in the game as its anime Aladdin protagonist, Vaan, is trying to leave the city of Rabanastre. The PS2 version is ill-defined while every little line in the remaster is popping out. The embossed lines and glare on the soldier’s armor are competing along with the highlights on the pavement and the cracks in the mortar on the back wall with everything else going on in the scene for attention. By themselves, each little details feels fresh, but taken as a whole it’s a bit of a mess, making the simpler up-resing of the emulator look like a better middle ground. “It takes a lot of training to make a thin pixel art “jagged” line look smooth. You have to carefully paint the lines and selectively blur the edges to look good to the viewer. Anti-aliasing pixel art without muddying your shapes is practically an art form in of itself. When you don’t have a lot of texture memory, every pixel counts! The artist had to handpixel every of those loops perfectly in order to get that metal to pop like that. In the game’s Garamsythe Waterway, a labyrinth of aqueducts and passages below Rabanastre, you can see what’s lost when new layers of detail and contrast are thrown on top of the old edifice. The Waterway gets noisy. Foggy backgrounds are replaced with incandescent streams, while the nearby pillars look less ancient and more like a veneer. Yang argues that there’s a “truth to materials” effect which gives the original a more natural and authentic feel because it was the direct result of many people crafting a vision within the confines of the PS2's technical limitations. The Zodiac Age, put together under the constraints of time, money, and an outside studio rather than those of the PS4 is less focused as a result. “If I had to guess, the artists probably did this: (1) scale up texture by 200%, (2) increase contrast, (3) desaturated a little for that grayish next-gen feel, (4) apply a sharpen filter, (5) overlay a noisy detail texture on top to try to make the surface look more detailed,” he writes. More eye-catching like like the over-saturated photographs of blue sky or ocean sunset you might see at a local street festival but lacking intent, with algorithms and automated up-scaling making the original scenes and visual moods more diffuse. The Zodiac Age, for all its improvements, lacks that aspect at times, at least in its visual presentation. “They are impressionists in the sense that they paint not landscapes but rather the sensation produced by the landscape,” Castagnary went on, and it seems to capture the difference between the two games well. The trees look more like trees in the remaster. The walls have more stones in them, but as Yang writes, “that’s not a particularly honest nor interesting thing for a wall to say.” And while Vaan’s abs no longer look like something out of a horror movie, the overall sensation of the rest of the game has been flattened and lost between all of the sensory overload to achieve that effect.